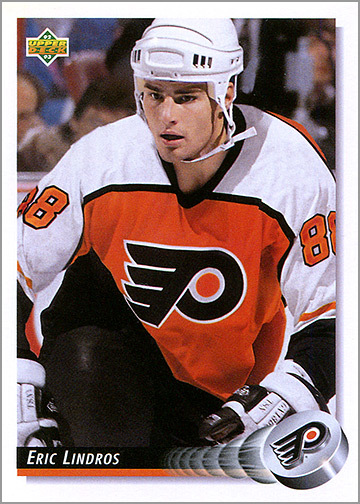 Eric Lindros will have his number 88 retired by the Philadelphia Flyers tonight in a pregame ceremony. 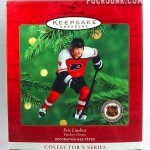 He made the double-eight famous during his eight seasons with the Flyers. 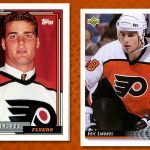 Lindros had a lot of hockey cards made during his career — many even before he even skated in an NHL game. 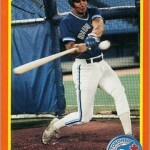 I thought it would be fun to take a look at some of his more offbeat cards. 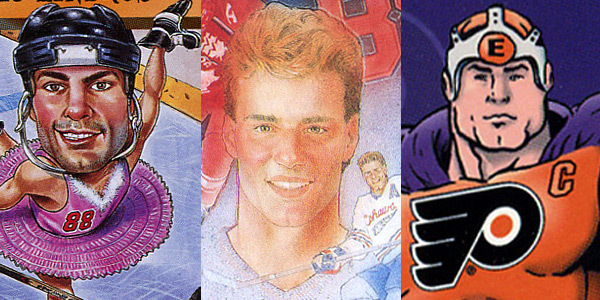 So, here are 10 Eric Lindros hockey cards that are strange, odd or just downright ridiculous. 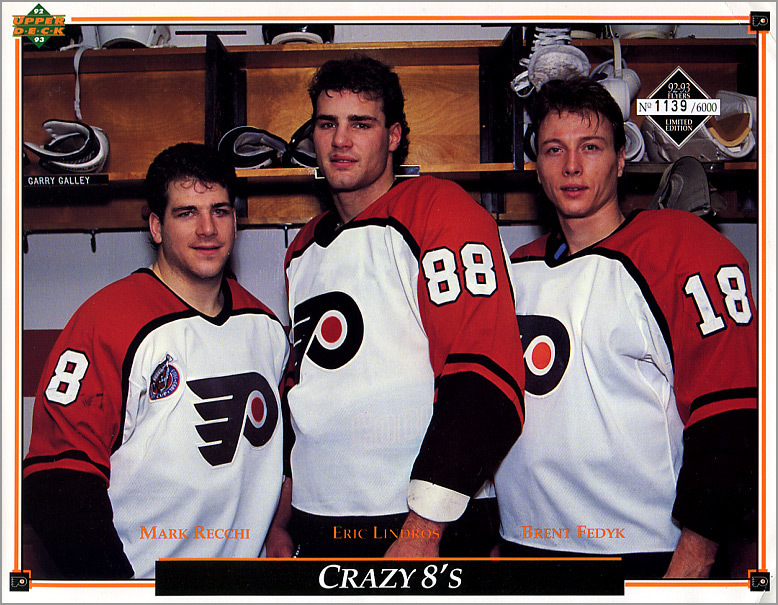 Before Lindros centered the “Legion of Doom,” he centered a line with Mark Recchi and Brent Fedyk called “The Crazy 8’s.” The line was named as such because Recchi wore number 8, Fedyk wore 18 and Lindros, of course, wore 88. 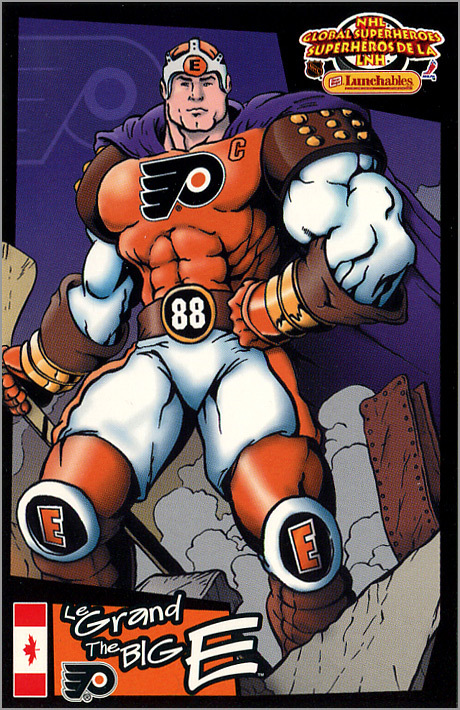 This oversize (8.5″ x 11″) trading card was given out at a Flyers home game vs. the Maple Leafs on April 4, 1993. 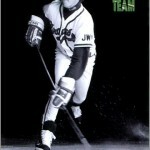 Every issue of the magazine Sports Illustrated for Kids came with nine trading cards, perforated so you could pull them apart. 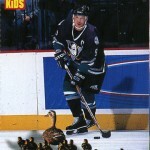 Sometimes, Sports Illustrated for Kids made funny April Fools Day cards, such as this one of Paul Kariya. 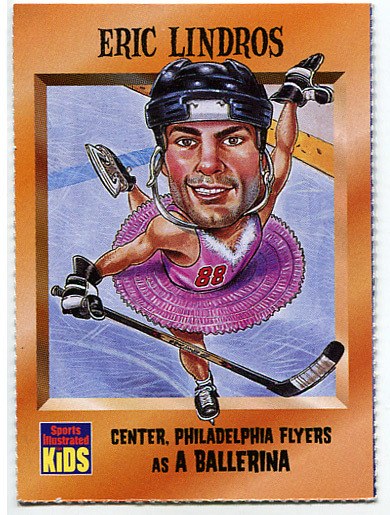 This card came in the October 1997 issue of Sports Illustrated for Kids, and is meant to be a funny Halloween costume idea for Lindros. The back of the cards claims that no one would dare laugh at him if he ever did dress as one. I agree. 1989-90 Seventh Inning Sketch #195 – Where in 91? 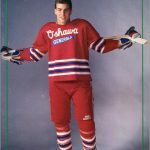 When Upper Deck issued their 1992-93 hockey card set, they didn’t have a photo of Lindros with the Flyers — so they created one, superimposing his head on Rod Brind’Amour’s shoulders and “88” on his sleeves. 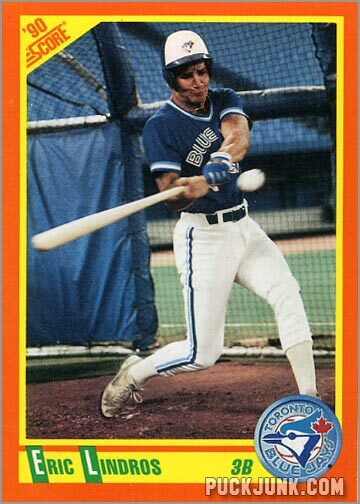 The card was somewhat controversial, and the long-standing practice of head-swapping on trading cards was retired shortly thereafter. 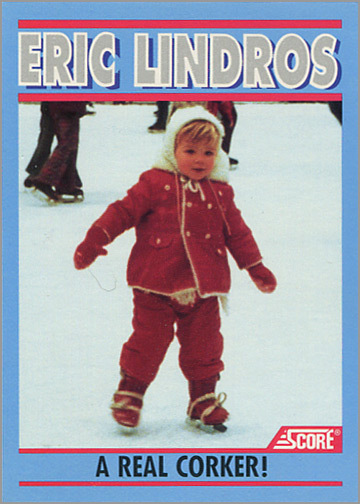 Lindros wrote an autobiography in 1991, entitled “Fire and Ice.” Three special Score trading cards were available via mail as tie-in promotion with the book. 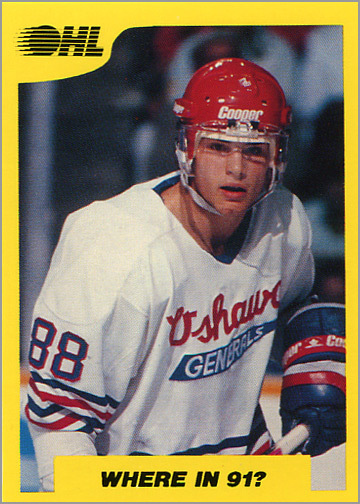 One card showed Lindros at 20 months old, learning how to skate. 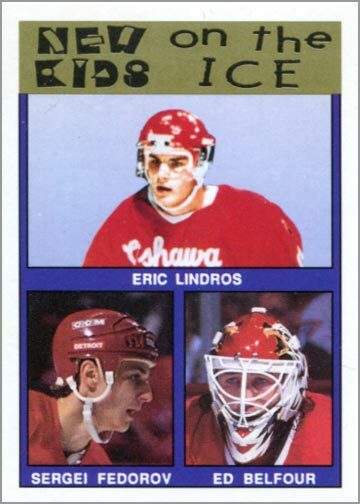 The back of the card explains that Lindros didn’t start playing hockey until six and-a-half years of age, and that when he got his first set of equipment, he was so excited that he wore it all day long. 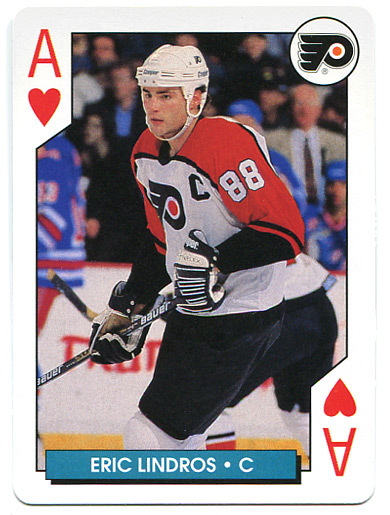 Lindros had over 35,000 — yes, over thirty-five thousand — of these three-card sets stashed at his parents house. 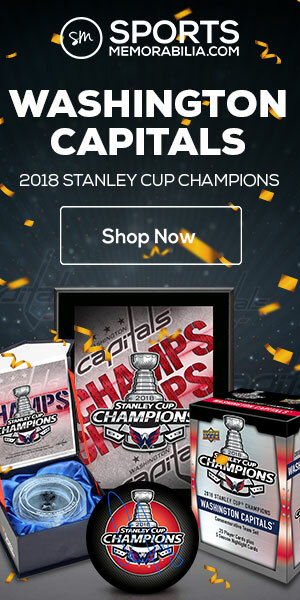 He sold them on the Classic Auctions website back in November. 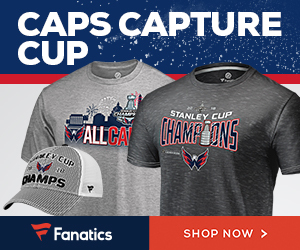 The lot received one bid of $300. Usually, millionaires or U.S. Presidents commission portrait paintings. 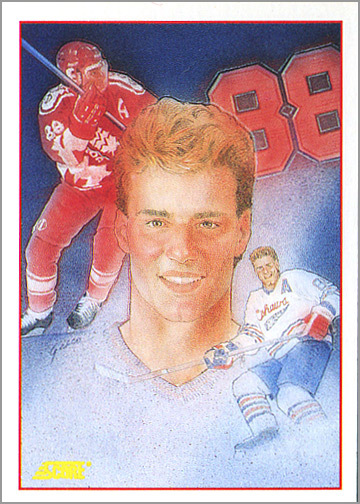 At 18, and even before he played in an NHL game, Score had this painting of Lindros created, and put it on a card in the 1991-92 Score Hockey set. I’m real “liking” what you have so say. I’ll be waiting for more.